MANILA, Philippines - The August 2017 Sanitary Engineer board exam results, which include the complete list of passers, topnotchers (top 10), top performing school and performance of schools are available on this page as officially released by the Professional Regulation Commission (PRC) and the Board of Sanitary Engineering on Tuesday, August 15, 2017 or in three (3) working days after the exam. UPDATE: As announced, 80 out of 155 passed the exams. As announced, 80 out of 155 passed the exams. Paulo Vincent Juan Jose National University (NU) -Manila topped the board with 82.75%. The second Sanitary Engineering board exam this year was administered on August 8, 9 and 10 in the city of Manila. PRC advised that registration for the issuance of Professional Identification Card (ID) and Certificate of Registration will be done on-line. Please go to www.prc.gov.ph and follow instructions for initial registration. According to PRC Resolution No. 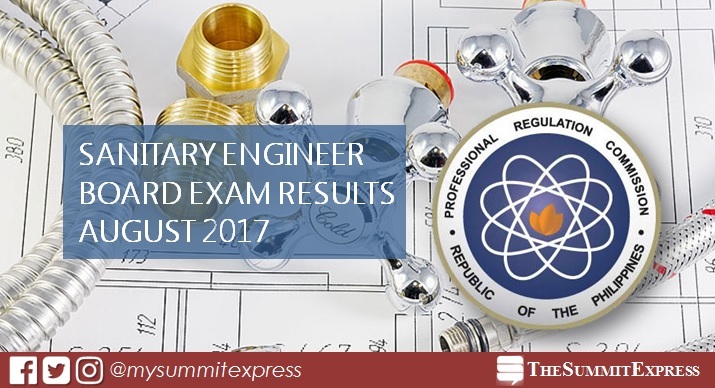 2016-1019, the target release date of results of the recent Sanitary Engineer board exam is on Tuesday, August 15 or in 3 working days after the test. In the same period last year, results were announced online in just 2 working days. PRC named 84 out of 143 who have passed the Sanitary Engineer Licensure Examination. Technological University of the Philippines (TUP) - Quezon City was the lone top performing school, 84.62% or 11 out of 13 passed the exams. In the January 2017 Sanitary Engineer board exams, a total of 62 out of 95 passed the examinations. Batangas State University (BatSU) topped the schools with 80% or 12 out of 15 passed the tests.